Speaking of 'what's wrong' - is it wrong to start showing a little favouritism when it comes to authors and illustrators? I'm TRYING to be objective here. I really am. But Phillip Gwynne's books are really, really starting to override my well-developed diplomacy. He's a clever, clever man. I love this book. There, I said it. Who wouldn't love a wobbegong in Speedos with a Euro beach towel and a retro radio? Who wouldn't love a nosey-parker crab, a sticky-beak stingray and gossiping clam in board shorts? Who wouldn't love text that lingers on the tongue and makes you smile and smack of 1960s picture book classics? 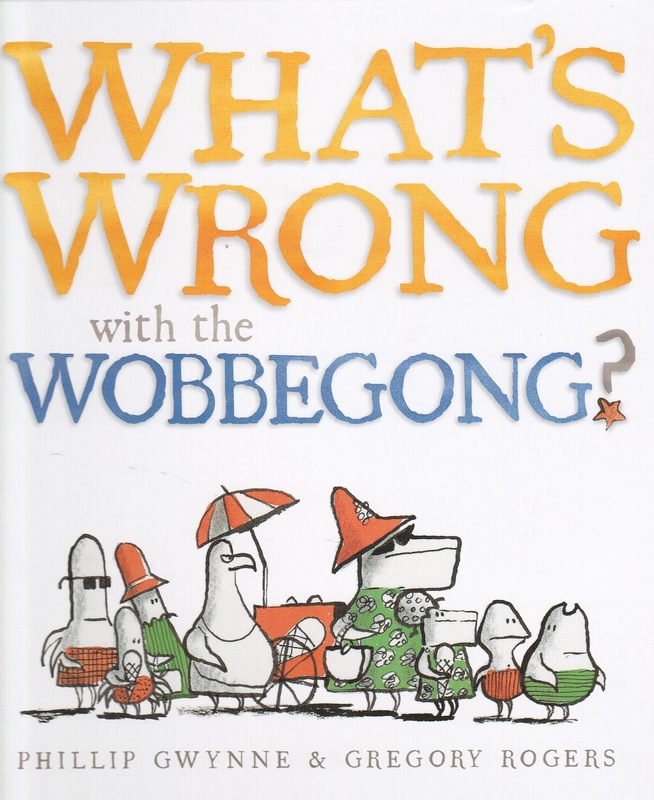 When a whale in a frock, an octopus family and a seabird selling ice cream join in the gossiping tirade about the wobbegong and all his perceived faults - 'he's pale, he just lies there, he doesn't eat a thing...' - we know something's gotta give. 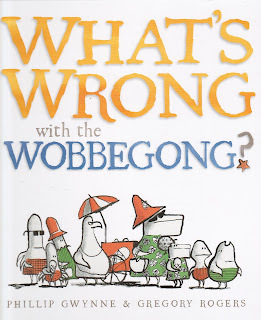 Funny, dry, fabulous, What's Wrong with the Wobbegong is one of illustrator Gregory Rogers' last picture books and is a true treasure to behold, after his recent, tragic passing. The combination of Gwynne and Rogers in this book is talent personified, and this is a must-own picture book for anyone who loves - picture books. Agreed, this is a fabulous book. Gregory was a master of an amazing array of illustration styles and techniques, and although he loved experimenting, he was never satisfied with less than perfection. In a talk he gave, he described the painful thought and decision making process prior to commitment of each brush stroke to expensive paper, in the same way that an oriental calligrapher contemplates each gesture before mark making. This is Gregory at his most creative, enjoying responding to Phillip Gwynne's wonderful words so much loved by us all.